Yes, It’s that time again. Days are getting longer, Seed Catalogs are in the mail, and we are, OFF!! Only a few short months, and we are in the ground, and there are some chores to do beforehand outside, but for now, we shall grow, something. Racking, table top, pantries, under the stairs, in front of the window, doesn’t matter where, it’s time start looking for that out-of-the-way spot. There are several options, several methods, and the seed catalogs are in the mail. Some of you already have your first shipments. Some are “Old Hat”, others, “new-at-it”. Let’s talk basics. First is where. Finding that “spot” that is out of the way, not near a cold entry, and not under a heat vent. Somewhere that is a constant temperature above 54 degrees. Seems chilly but it will work. If you know Forsythia, it blooms when the soil temperature is 54 degrees at 4 inches for 5 days, and we have gained 2 hours of daylight. Most germination occurs soon after. I have my main rack in the laundry room. 4 shelves, 2 light fixtures. Plenty of room. As I do laundry, I tend to the seedlings. I have seen nice set ups in an unused pantry as well. The “Pantry Thing” usually works great with the Apartment Folks, or in a big front window or patio doors. Just make sure to turn them weekly. 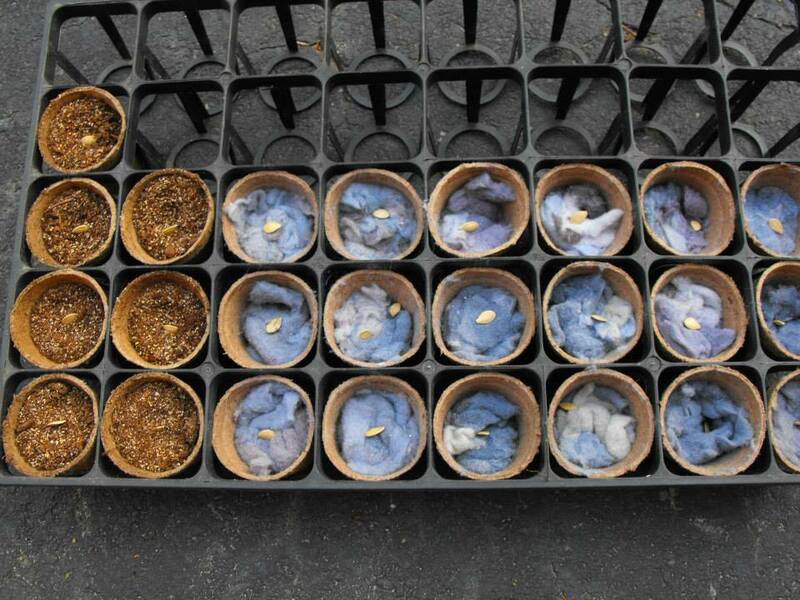 What to use to start the seedlings. Egg cartons, plastic salad containers, newspaper cups, toilet paper tubes, old plant flats, bottoms of milk or soda bottles, store bought starter flats. 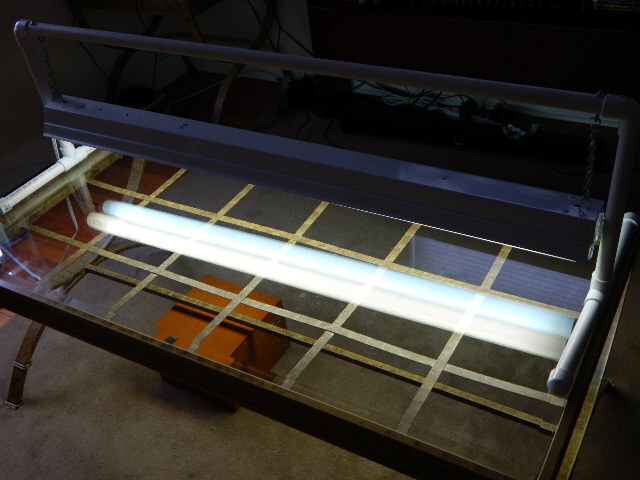 As long as it fits under the lighting fixture and holds soil or dryer lint… Also, how do you sow the seeds? 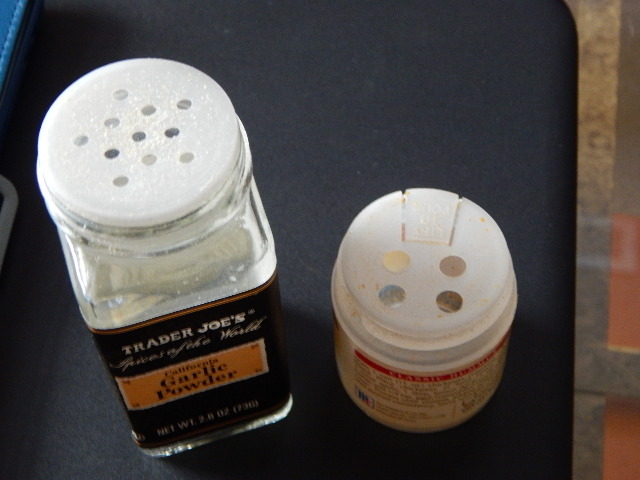 I save empty spice shakers. They all have different sized holes, and there are different sized seeds. I get the flats ready, put the seeds in the shaker, and “season” the flats. So much easier to shake and sift. Next, lets chat about proper lighting. My fixtures are 2 gang, 4 foot florescent fixtures. I never use high dollar “Grow Lights”. I have one Cool White and one Daylight bulb in each. With that combo, you will get the color spectrum of light from reds and oranges for germination to the blues for leaf production through photosynthesis as they emerge. And way cheaper. They are on a timer, 8 hours on 16 off per cycle, 2 inches above the seed flats. As they grow, I raise the lighting fixtures. Remember, if you only have a window area, make sure to turn the flats weekly 180 degrees, they will be doing that “lean to the light” thing, making them leggy. Notice the difference in color in the bulbs below? 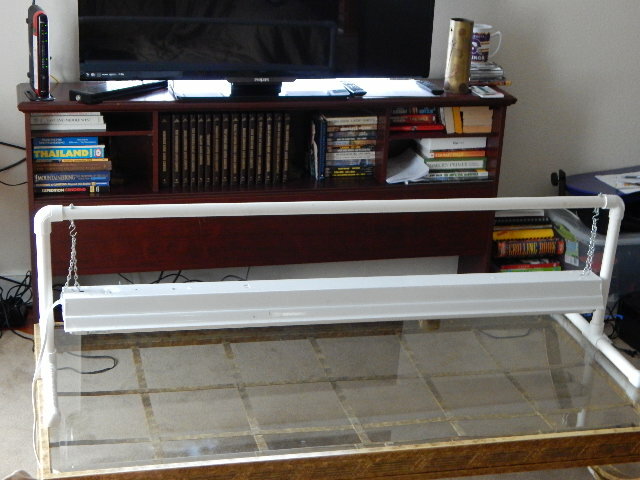 This tabletop rig is about $7.00 in PVC pipe and the light fixture is around $17.00 including bulbs. No need to glue it together so it can be easily disassembled for storage. This is a FREE rack from a store I found that I currently use. 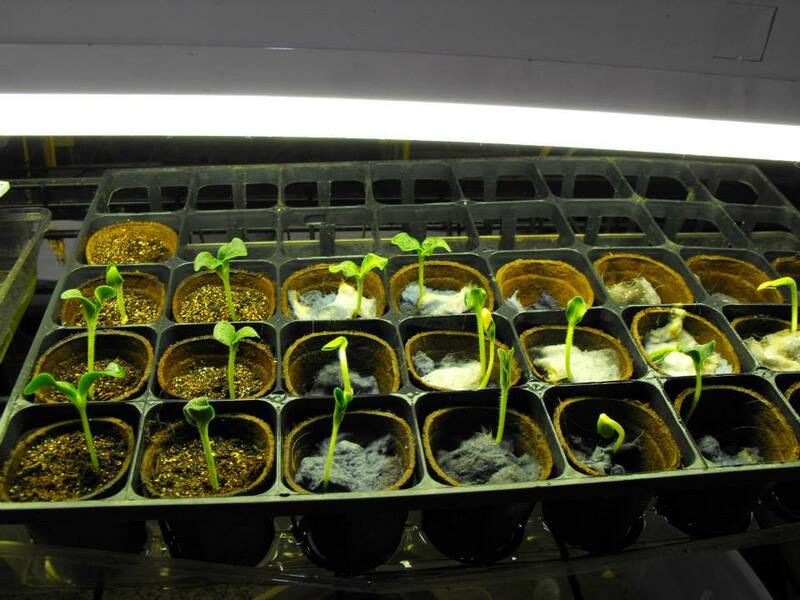 Always a question from my readers is “What soil?” Here’s the deal about germination. No Potting Mix. No NPK. Just about any seedling, as it emerges from the seed, produces 2 leaves, which are not “true leaves” but seeking light to perform photosynthesis. The root does not want any food yet, not until 3 to 4 leaves emerge, that’s when they are forming feeder roots. I have used straight Peat Moss in the past, but in the last 4 years, I save all my dryer lint in coffee cans, and use last seasons seeds to start. That equals FREE… As the seedlings get those 3 to 4 leaves, then I feed with home made Manure Tea that I start “steeping” when I see mostly 2 leaves. And I always feed from the bottom, so the nutrient is wicked up through the dryer lint, and the roots have to go deeper to get to it. I make my plants work for it!! More root, more bloom! Below is a comparison between a starter soil and dryer lint. Insects and fungus. Always a particular when starting seeds indoors. One of the things I always do is spray home made Insecticidal Soap in the starter medium for Fungus Gnats. I have also used a Bt solution as a topical spray if needed. 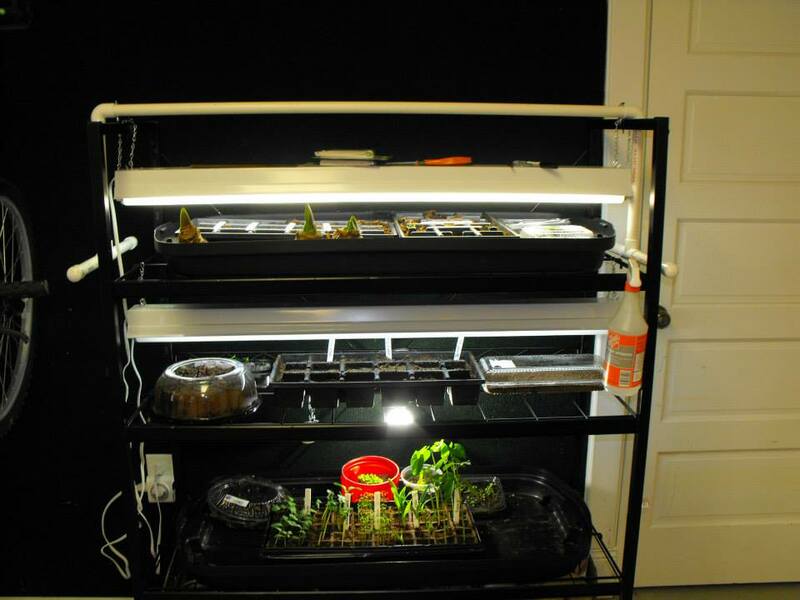 To alleviate fungus conditions, a small fan about 5 feet away on low will help there. If you are using those Seed Starter Greenhouse kits, a pencil under one corner of the lid helps greatly for ventilation, or even a small fan. The first seeds you want to start indoors are Tomato, Pepper, Eggplant, Lavender and Onions. They take the longest. Most packet seed has that “Emergent” chart on the back. For example, if it takes 3 weeks to germinate, add 3 weeks to that, and then subtract that time from your last “Killing Frost Date” in your zone. That’s when you would start indoors. This time frame will give you a week to 10 days in the end to get them hardened off before planting. Hardening off is not only to get them climate adjusted, but also natural sunlight adjusted. This goes for your Perennials as well. Forcing bulbs and late Winter cuttings is always a fun time. Hyacinth and Paperwhites, Forsythia, Dogwood, Japonica Camelias, Azalea, give gardeners the “illusion” that Spring is coming. Winter has a bit to go yet, but my vases and grow racks tell me otherwise. When my Forsythia pops indoors, seed racks are planted. Simple enough. Next month we will cover the “emergence of the seedlings”, and more info on the care after you see them, then the fun begins.